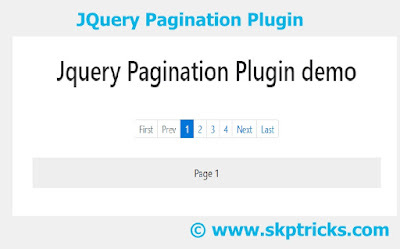 In this tutorial we are going to learn how to use JQuery Pagination Plugin, which automatically create pagination buttons based on our requirement (create button like first, last, previous, next etc). This plugin help you to create simple, effective, and useful pagination for your site. All you need to do is specify an element (preferably a ul or div) and the plugin takes care of the rest. This pagination requires Jquery library, the plugin itself, and optionally the Bootstrap CSS (as it helps to create formatted button with help of Bootstrap CSS). Follow the below steps to include this JQuery Plugin in your web based application. Include the below Bootstrap CSS style file, JQuery Libray File and twbsPagination Plugin in your html file. Include the below html tag in html file. Last step is most important one. Here we need to call twbsPagination function, which is a part of this Jquery Plugin. Some important attribute of twbsPagination function. totalPages - The number of pages. visiblePages - Max visible pages. first - Text label for the 'First' button. prev - Label for the 'Previous' button. next - Label for the 'Next' button. Lets see the complete source code of wbsPagination Plugin that we have implemented for this tutorial, This may help you during the integration of web based application with MySQL. This ready made plugin save your time and effort. 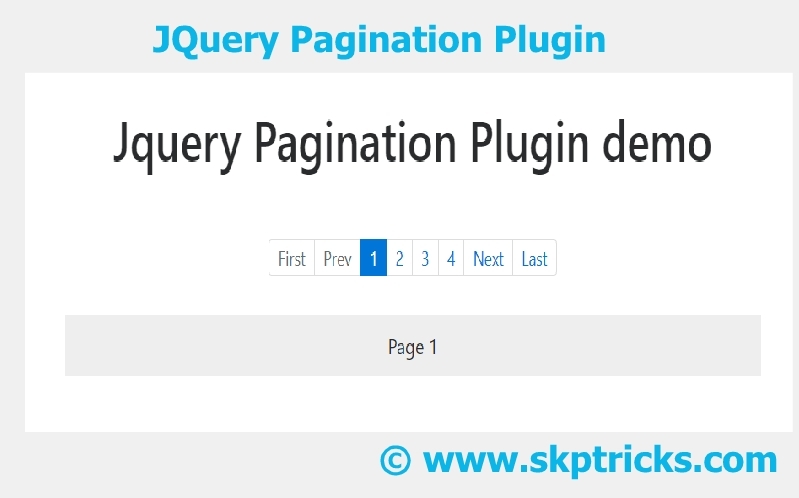 This is all about wbsPagination Jquery pagination Plugin. In case you have any Questions, please do comment in comment box below.